Community Medical Center has a safe and convenient way for the community to dispose of leftover and expired medications. 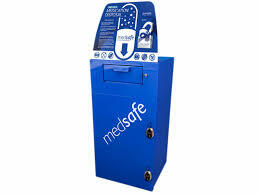 Anyone can bring medications to the Sharps MedSafe dropbox any day at any time. The MedSafe box is located insied the front entrance of the hospital, next to the chapel. The Medsafe is secured to the wall, monitored by camera surveillance, and double locked with limited key access. Deposited medications are sent out of state to a certified disposal site. Drug Enforcement Agency (DEA) sponsors National Drug Takeback Day every year in April and October to raise awareness of the dangers of improper storage and disposal of prescription medications. The next National Takeback Day is Saturday April 27, 2019. Nebraska Meds Coalition was formed in response to studies by the U.S. Geological Survey and others that found traces of pharmaceutical and personal care products in drinking water supplies across the United States. Funded by a grant from the Nebraska Environmental Trust, Nebraska MEDS implements educational efforts and supports a pharmacy-based medication disposal program utilizing the Sharps Compliance TakeAway Environmental Return System. The program promotes safe medication disposal by allowing patients to turn in expired or unused medications at participating pharmacies.